Math-Play.com has a huge selection of online middle school math games. The Exponents Jeopardy Game is pretty cool! You can choose from 1 - 10 teams (or players). There are 13 different avatars to pick from so everyone is sure to find one they like. The default will give you colors for team names, but you can also customize this. There are 3 categories - Evaluating Exponents, Equations with Exponents, and Exponents with Fractional Bases. Each has 4 levels from $100 - $400. The questions are of an appropriate difficulty level for middle school students, not to hard, but not too easy either! Each multiple choice question allows 100 seconds for a correct answer. 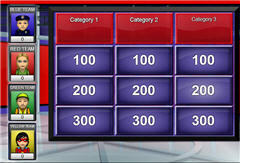 You'll hear applause for a correct answer and a buzzer for incorrect answers. For single-team (player) mode, you can print out a certificate those shows your score. For multi-team (player) mode, the winner is shown on the screen as the Champion. I thought this was an impressive little game. Simple enough for students to handle on their own, interesting enough to play more than once, able to be used for whole-class interaction on an ActivBoard, and offers plenty of options and customization to fit most any need you have in your classroom. Great way to practice and review exponent skills!! !